Toyota OEM repair procedures contain helpful guides to steps that must be done every time a repairer disconnects a battery and replaces other parts, according to Collision Advice CEO Mike Anderson. They can be found in the “decision tree” to the left of the manual in Toyota’s “TIS” official repair procedure website, Anderson explained on a webinar done in conjunction with Toyota last month. The common repair step of unplugging the battery can add complexity to what seems like the most basic of work by triggering the need for additional repair procedures. Crediting Collision Diagnostic Services industry relations director Jake Rodenroth for the tip, Anderson gave the example of a battery ground wire connected to the fender, an apparent reference to a condition found on vehicles including the 2012 Toyota Camry and 2013 Lexus ES350. As Toyota CRIB No. 184 notes, the ground wire is connected to the fender brackets on those vehicles. Removing a fender means disconnecting the ground — which means disconnecting the battery. Toyota’s guides are not only kind enough to tell you what procedures are necessary after disconnecting the battery in this or any other situation, they’ll also tell you what will get screwed up if you fail to complete that work. 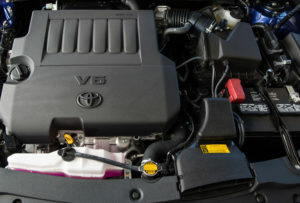 In this case, disconnecting the battery on the 2012 Camry can mean the shop must recalibrate the steering angle sensor — or else the “parking assist monitor system” (the lines indicating the car’s direction on the backup camera) available as an option on the SE and XLE trims won’t work correctly, according to TIS. 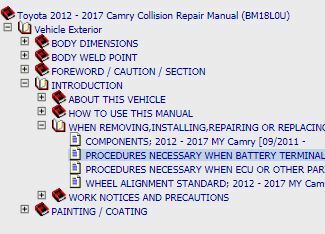 The same warning exists for all 2012-17 Camrys, and it becomes more crucial starting it became standard on all trims beginning with the “2014.5” model year — the warning becomes more crucial. Toyota’s collision manuals also explain what must be done any time an electronic control unit or various other components are replaced. These can be longtime automotive items like spark plugs (inspect them after a replacement, Toyota says) to more modern electronics. For example, Anderson said that replacing a door power window regulator means the shop must initialize the power window control system. Otherwise, the automatic up-down feature won’t work, and “some of the other things won’t work as well,” Anderson said. “It’s important that when we disconnect any type of component, we actually go to this section of TIS to see what types of initializations or calibrations we need to do,” Anderson said.